The G’zOne series of phones are unlike any other found in the U.S. market, and the new Boulder steps up the game. Known for their rugged nature- the phone meets Mil Spec 810F standards for water, shock and dust- the Boulder brings new innovations like a digital compass and flashlight feature that would provide useful to the outdoors crowd. 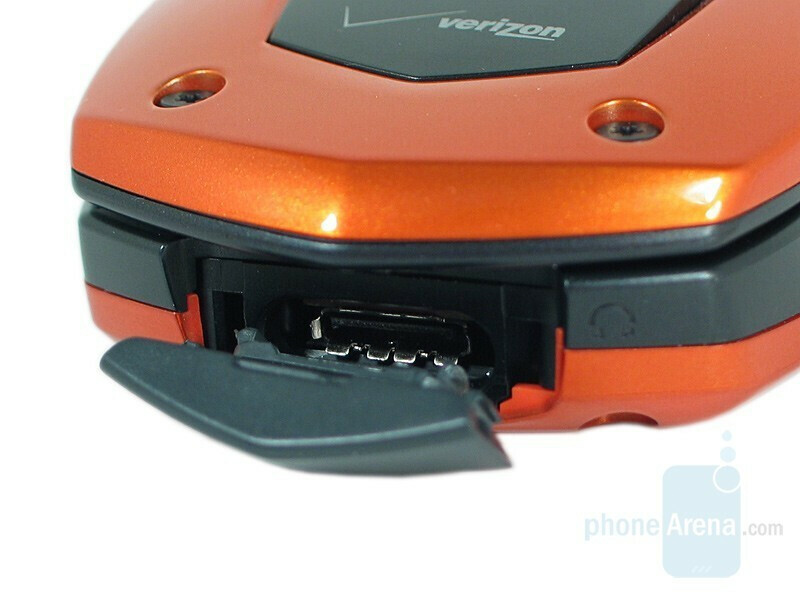 It also runs over Verizon’s EVDO Rev. A network, and along with the Motorola Adventure launches their second generation Push-to-Talk service. The G’zOne line has never been known for its size, but the Boulder does a good job of becoming a bit more compact. 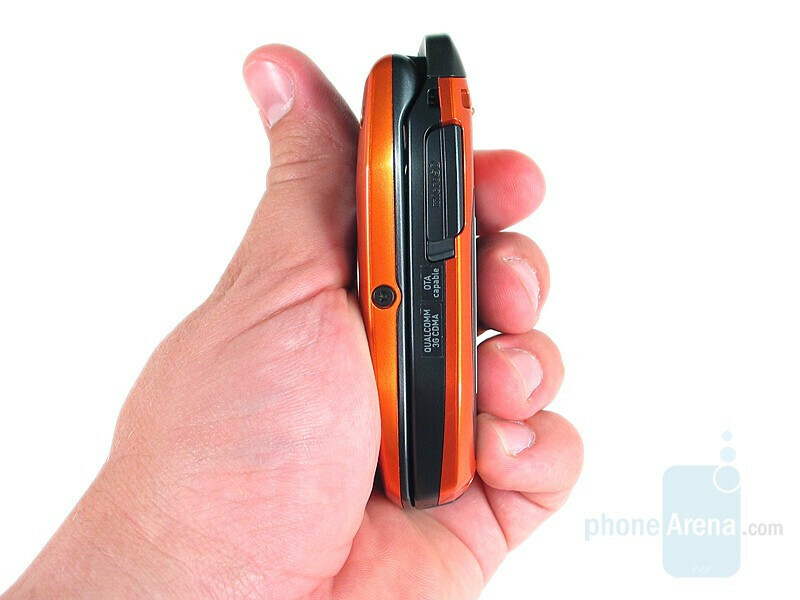 Gone is the unsightly antenna, and the phone dips below the 1” mark in thickness. 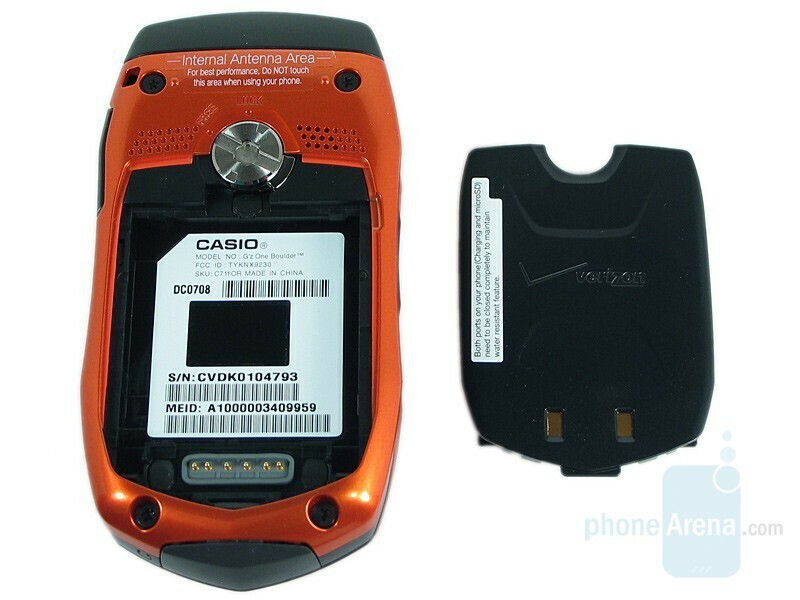 You can compare the Casio G'zOne Boulder with many other phones using our Size Visualization Tool. 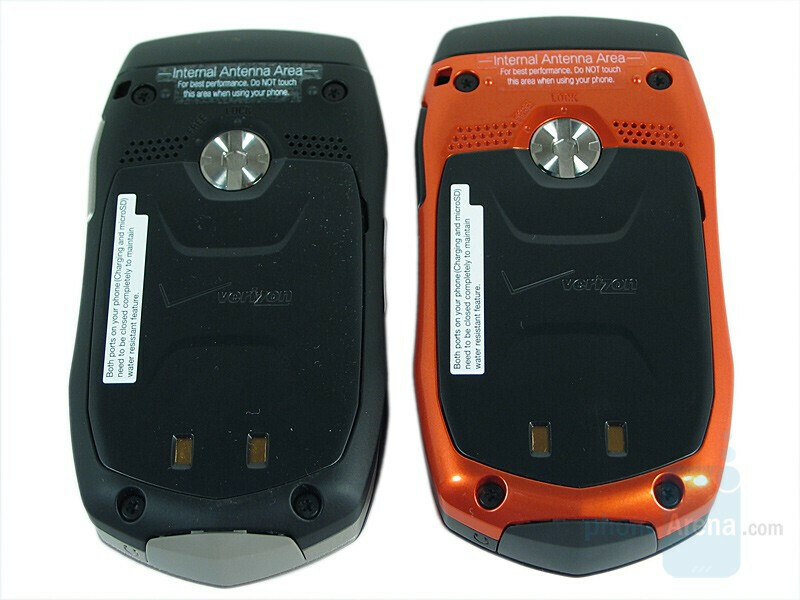 It comes in two color variations: orange with black accents and black with silver accents. It has a somewhat pointed design, almost reminiscent of the faceting on the Touch Diamond, that gives the phone a very masculine look. With the flip closed the front features a large circular white-on-black display that is easy to see in any sunlight. 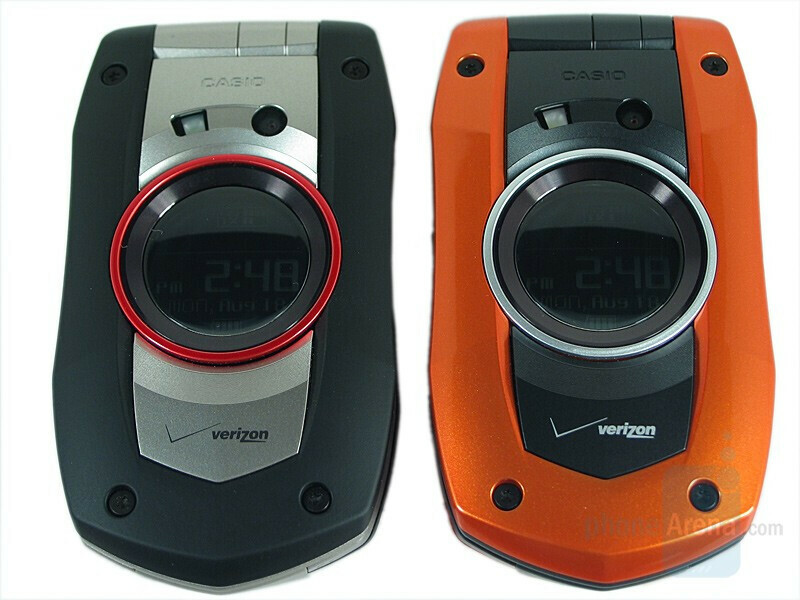 The display is outlined by a removable ring: the orange version has silver and black rings and the black version has black and red. 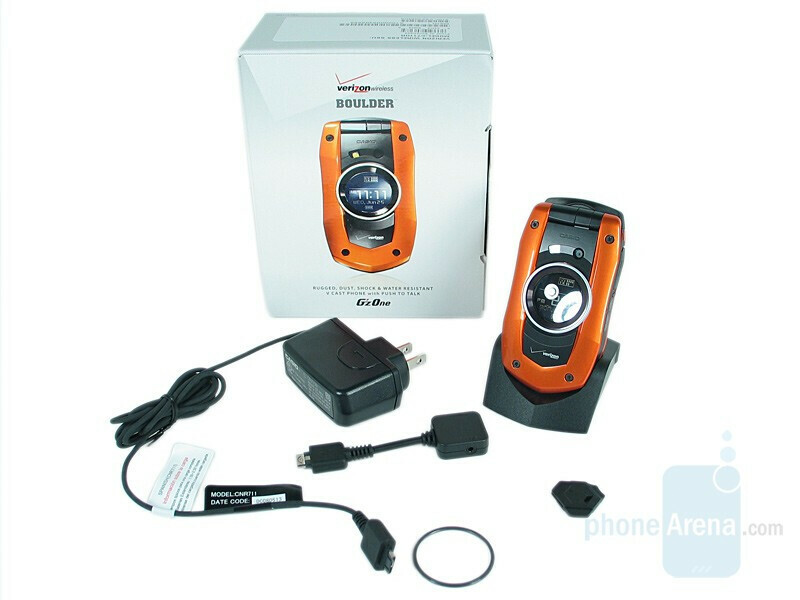 Above it is the 1.3 megapixel camera with flash, which is up from VGA on the Type-S, but still not the 2.0 originally found on the Type-V. The black version is available also in a camera-less variant. The front and back housings are held on by visible torque screws that enhance the bold appearance. The left side features a small PTT key near the top, with a volume rocker and multi-function key below. When the flip is closed the key activates the compass with a press and hold. When opened a press initiates voice command and press and hold records a voice note. 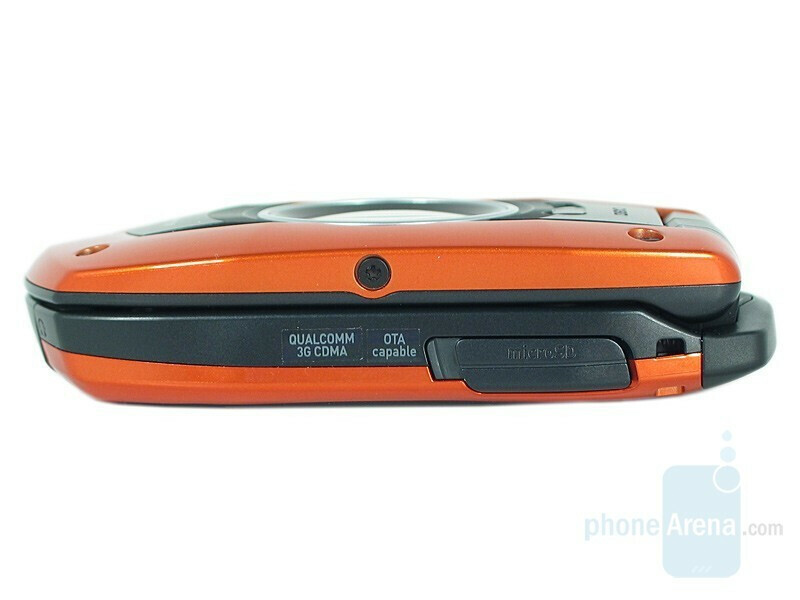 The right side is button-less, and has only the covered microSD slot at the top. On the bottom the charging/data/headset port is covered to ensure water resistance. 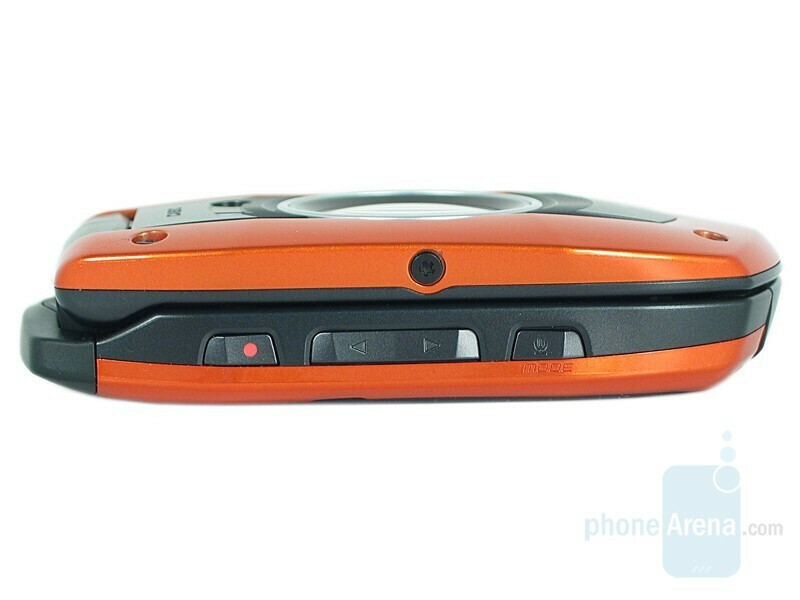 The back of the phone features a locking mechanism that holds the battery in place. Flanking the lock are speaker cutouts, though only the one on the right is functional. Opening the flip reveals a small but crisp 2” QVGA display. The display is only 65K colors, but images look sharp on it. The five way directional pad has two keys to each side; soft keys sitting atop the camera key and speakerphone/flashlight key to the left and right, respectively. 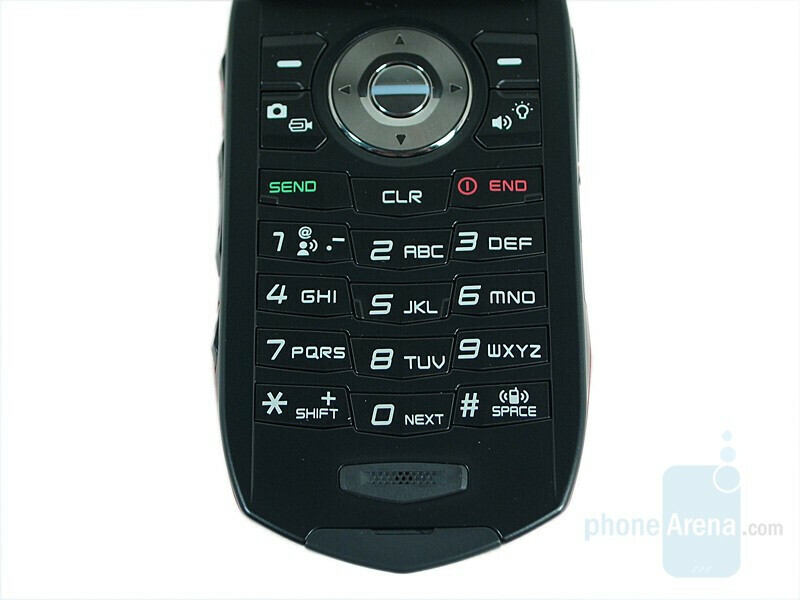 The keys are backlight in a reddish orange color that looks much better on the black keypad of the orange unit than the silver keypad of the black. They aren’t terrible, but are very soft feeling and we would have preferred a more definite feedback when pressed. As you’d expect from a Mil Spec phone the Boulder is built to the highest quality. Though constructed of plastic, the fit and finish are excellent and we have no misgivings about the phone’s long-term durability. The overall in-hand feel is pretty good, though it is a bit on the thick side. The black of the black and silver version is soft touch paint, which makes for a much better feel than the hard plastic found on the orange variant. The internal antenna makes the phone feel a lot smaller than previous G’zOne iterations, and it is indeed lighter this time around. With the bold design lines we prefer the orange version aesthetically; black and silver just look too plain for a phone of this nature. thanks! although it doesnt look as a good phone being so rugged is so coool! exept vzw's evdo/rev A service is many times larger than nextels total coverage, where even in flat florida (where revA is 100% of coverage), nextell still has major dead spots/zones/citys. There is a software update availible (OTA Download) for the boulder that fixes the voice issues and some of the PTT drop issues. 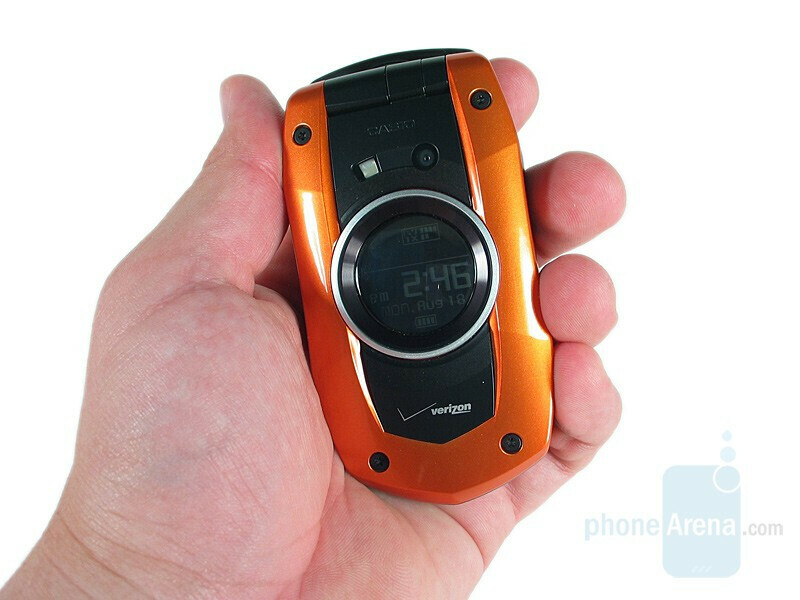 If you dont need the waterproof, the moto Adventure seems to be a better overal phone for voice/battery/ and PTT. Its still ruggedized, just not waterproof. Companies are leaving in droves and getting off of Nextels shabby service and grabbing the PTT on verizon. Most companies only talk to their own emp's on PTT. And in the end, PTT may still be slightly better on nextel, but the overall quality is horrible, especially if you just want to make a call. i work here in FL, and companies are jumping the nextell ship as fast as they can. Heck, they were trying to do it long before the new VZPTT, but couldnt get rid of the service. its sad that in a major city like jacksonville, that they cant even keep service in large parts of the city. No, its not as solid as nextell's ptt, as its their only service of value. The software update on the boulder fixes some of the sound/ptt issues. Its not the service, its the phone. Again, the moto750 has much better call quality and less issues, but lacks the waterproofing. im glad youre drinking the kool aid, but the service is terrible. i was there when ptt launched, i was then with nextel, and now im back when its relaunched on vzw and its just as awful as ever. ive used the adventure much more than the boulder, and its still unacceptable. that fact that were charging people an extra five bucks for this is laughable. we should be paying them to use it. Actually my father still maintains his contract with Nextel and I still retain one of their phones along with my Alltel and AT&T. I live in Jacksonville and I used to live in St.Augustine. Jacksonville was never much of an issue with me. St.Augustine though had NO service in so many parts. I couldnt even use my phone within 5 miles of my house. It was horid. Westside I never had a problem, neither did I in the South and Northside. Where are these major gasps in Jacksonville you are talking about? is it really that bad? this phone looked very attractive to me. I wish they'd release a GSM version of this handset, the only couple of rugged handsets available don't look as nice as this one! It sounds much worse than they're admitting here. 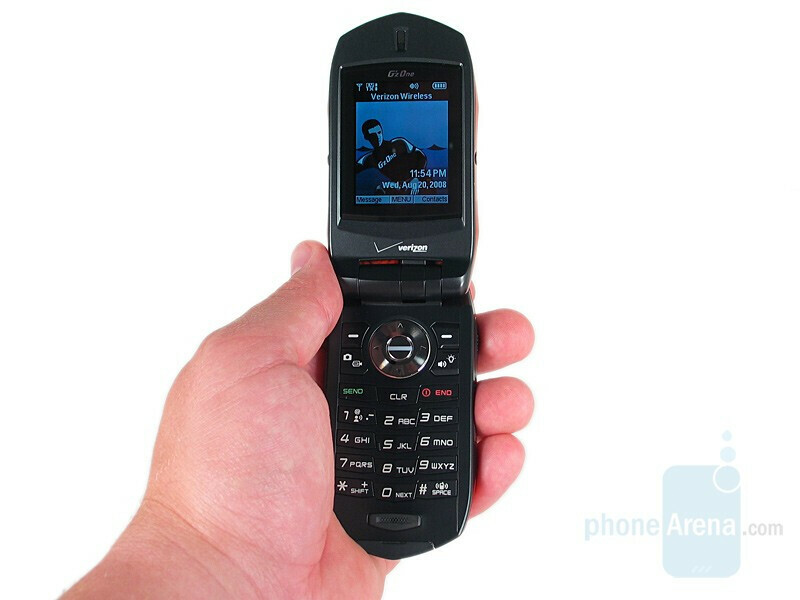 It is the worst-sounding phone I've ever used -- and I've had cellphone with Verizon for nine years. Agreed. I have always had Motorolas and been very happy. Even washed my startac and it kept working. Left it in the rain and it kept working. The Casio sound (receiving only) is so bad I couldn't understand any of my voice mail or home messages and half the words from friends. I tried it in two very different states and in extremely varying conditions (mountain, ocean, city, etc) and it was consistently bad. The update (OTA) was not available but I am curious whether it worked or not. I would recommend this phone 100% if only the receiving sound was understandable. For active people, it is PERFECT ~ except they don't take into account the large growing number of females who would like a phone like this that doesn't look like they borrowed it from their boyfriend. Waiting patiently for the 4th generation. All that is meaningless when the company is on its deathbead. They will leave because they do not want to sign another 2 years with a bloated corpse. "company on its deathbed"??? Sprint generates billions in revenue! You vz buttboys are incredible. Sprint will be around for a long time, probably longer than vz's push-to-wait service. The software update improved the call quality enough that I was happy upgrading to this phone. 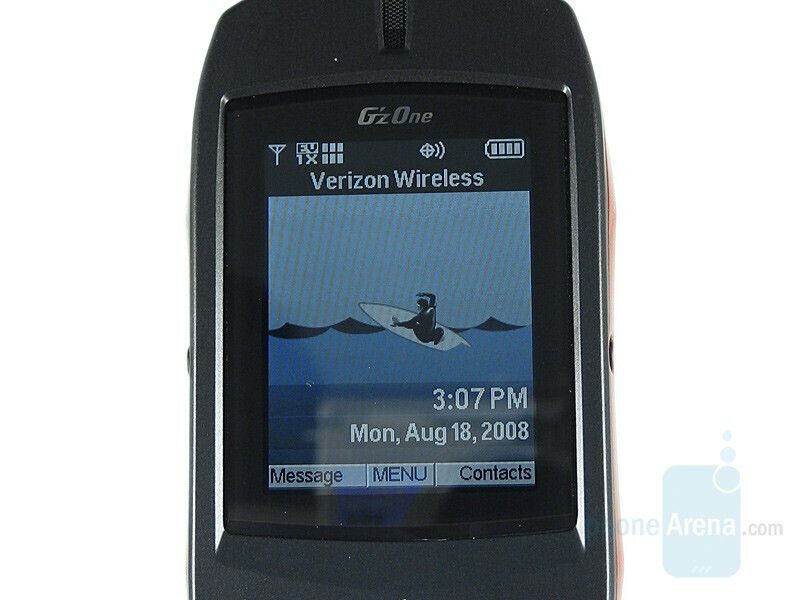 The call quality isn't as good as my LG Dare or any of my Motorolas, but it will hold a call where the Dare wouldn't. I also get 2-3 days out of a battery charge but I admittedly don't talk on the phone that much. Plus, I find the charging it with the cradle on the night stand is very convenient. I remember when all cell phones came with a charging cradle and have missed this feature on every phone I've had until this one. If you haven't tried this phone since the update, give it another shot- I'm glad I did. I've had this phone for a few weeks now and don't have any idea what people are talking about with battery issues. This phone was issued as a work phone for travel and emergencies, therefore I'm not talking on it much if at all. I finally put it back on the charger today after 10 days of stand by. If you are a 13 year old girl that texts all day and talks all night, this is probably not the phone for you. If you need this to make the occassional call when you need it, it should do fine. It doesn't sound much different than my other Verizon LG phone. If you turn the speaker down to a normal volume, there is no problem with the sound. I did notice it being a bit tinny when it was the volume was too high. I was skeptical about this phone when I was first issued it based on most of the reviews that I read, but have come to realize that most people don't make honest observations and just jump on the bandwagon whatever it may be. I've also noticed that Verizon is now completely sold out of all makes of this phone. Must not be that bad! Alright. I got this phone because I needed a new one. All you ever hear is people complaining about how poor the sound quality is. It really isn't that bad!!! I have a small amount of trouble hearing others when I'm in a noisy environment (slightly worse than my Samsung slider I had), but under 95% of the conditions that I'm in I can hear other people just fine. The sound quality is somewhat distorted when the earpiece is turned up really high, but once again, under most conditions I barely have it turned up halfway and I can hear just fine. Battery... I talk approx 30min a day on this phone. I spend 12hrs a day in the field at work where the signal reception is poor. This phone does just as good as others for signal strength. So with the 0-2 bars I do get, I still have 3/4 battery power. Just make sure the PTT feature is turned off. The compass works great when your not next to anything, or it can easily be off as much as 90* (if not more). The flashlight is handy (for me anyway) and doesn't drain the battery quickly. I wish the ringer was a little louder, and the vibrate makes more noise than it actually vibrates the phone. So, there is something to work on for the next generation... Would I recommend it? Yeah. Why not... If you don't like it, you can return it to Verizon within a month of purchase. i have the boulder and have never once had an issue with it, although mine is refurbished, maybe they worked out the issues,.....the call clarity is great, it is extremely water proof, and rugged, battery last for several days with moderate talking,...( and hour or two a day) i have owned samsung, motorola, lg,, sony, etc. phones,...this is my first casio,....but i love it. i do alot of fishing and always seem to get my phone wet,...ive been through nine in the past two years due to either water or dropping them,.......this phone is not only tough, but you can submerge it in water and receive a cal,...pick it out of the water and answer it. and when i say submerge,...im talking about 5 or ten minutes,....not seconds. granted, most of these reviews are from 2008, and i just got mine in 2011, and it is refurbished, so maybe they finally worked the bugs out,....not many frills or thrills, but for an outdoorsman in work and play, who just needs a phone to talk on, and a camera to take pics of the big fish,....its awesome.